In order to make a payment you must agree to these Terms of Service in their entirety; these Terms of Service constitute a valid and enforceable agreement between You and Lieberman Technologies LLC. Click on one of the underlines below for more information. You represent that you are competent and qualified to accept these Terms of Service. The function of Lieberman Technologies in this capacity is limited to accepting your payment. If You have questions about Your payment please contact Lieberman Technologies LLC at 812/434.6600. Your privacy is of utmost importance in this transaction. Your payment to this Tax Warrant Collection System will only be processed if Your Card Issuer authorizes Us to do so. Service Fees for making each payment are described in detail on our website. How your payment is determined is at the discretion of The Agency, not Lieberman Technologies LLC. If you believe an unauthorized transaction has been made through this Tax Warrant Collection System using your card, you should contact the entity that issued your card. This tax warrants collection system's STATEMENT OF LIMITED LIABILITY. Accurate information must accompany your payment in order for this Tax Warrant Collection System to process your payment. The timing of the transfer of funds to the Agency by this Tax Warrant Collection System may vary. A payment submitted through this Tax Warrant Collection System implies your compliance with the law. Other Terms of Service that generally apply. "Account" refers to the source of funds for Your Transaction; these sources can include an advance of credit, a debit drawn from funds on deposit, or a reduction of pre-paid funds accessed through a card. "Agency" means the sheriff's office to which You are attempting to make a payment via Lieberman Technologies through their contract for the processing of transactions. "Card" means a credit, debit, or pre-paid debit card issued by Visa®, MasterCard®, American Express®, or Discover®, as indicated by that association's logo on the front of the card. "Claim" means a formal challenge regarding a payment made through Lieberman Technologies for a transaction which you believe is unauthorized, filed with your card issuer. "Lieberman Technologies," "Our," "Us," or "We" means Lieberman Technologies, Inc., an Indiana corporation headquartered at 223 NW Second Street, Suite 300, Evansville, Indiana, 47708, doing business under the name "Lieberman Technologies" and any of its parents, subsidiaries or affiliates. "Holidays" means all days on which U.S. banks are closed: New Year's Day, Martin Luther King Day, President's Day, Memorial Day, Independence Day (Fourth of July), Labor Day, Columbus Day, Veterans Day, Thanksgiving Day and Christmas Day. "Issuer" means a bank, thrift, credit union, or other financial institution or organization that provided or sold to You Your Card. The Issuer's name and contact information such as a phone number or website will typically appear on the back of Your Card. "Service" means the methods Lieberman Technologies uses to obtain an authorization to process a charge to or debit the funds in Your Account for the purpose of funding Your payment to an Agency. Lieberman Technologies DOES NOT PROVIDE LEGAL ADVICE AND THE SERVICE IS NOT A SUBSTITUTE FOR CONSULTING AN ATTORNEY. "Service Fees" means those amounts You will be charged for making a payment through Lieberman Technologies as disclosed to You through Our payment web site when You attempt to make Your payment. "Terms" means these Terms of Service. "Transaction" means a payment made or attempted with Your Card through the Service to an Agency. "Unauthorized Transaction" means a Transaction You believe was in error, was fraudulent or was otherwise made without Your permission using Your Card through Lieberman Technologies. "You," "Your," or "Yourself" means the individual who is attempting to complete a Transaction using a Card through the Lieberman Technologies Service. By initiating a Transaction You represent and warrant that You are either an adult at least 18 years of age, an emancipated minor, or legally acting within Your authority as an agent, contractor, employee, officer or director of an entity or organization. As such, We are relying on the fact that You are legally competent and able to contract and understand and agree, and do agree that these Terms constitute a binding obligation upon You or the entity or organization You represent. The function of this Tax Warrant Collection System in this capacity is limited to accepting your payment. We offer a process that You have chosen to use to make a payment to another entity, typically an Agency or a third-party that Lieberman Technologies is assisting to serve an Agency. We provide additional support such as toll-free telephone and email access to customer service representatives to assist with questions or Claims. If You have questions about Your payment please contact Lieberman Technologies, LLC. We will attempt to answer Your questions about Your payment, such as the amount, date, Agency to which it was directed, and payment type based on system records available to us. You may call 812-434-6600, send an email to IndianaTaxWarrant@LTnow.com, or send surface mail to Indiana Tax Warrant, Lieberman Technologies LLC, 223 NW 2nd St, Ste 300, Evansville IN 47708. When you use one of these options, include your county and warrant number. Lieberman Technologies will not, however, answer questions about the underlying obligation such how Your taxes, fees, fines, or other obligations were calculated, how an Agency may apply Your payment. Lieberman Technologies DOES NOT PROVIDE LEGAL ADVICE AND IS NOT A SUBSTITUTE FOR CONSULTING AN ATTORNEY. This Tax Warrant Collection System accepts and processes cards bearing the Visa®, MasterCard®, American Express®, and Discover®, brands only. We will not attempt to obtain authorization for a Transaction involving any other type of Card. Service Fees are non-refundable. It is your privilege to cancel any Transaction before making payment and becoming responsible for Service Fees, which will be charged to Your Account. This Tax Warrant Collection System is obligated by Our contract with the Agency to transmit funds as the Agency has directed for all Transactions involving that Agency. Once funds have passed to the Agency from Lieberman Technologies, the Agency is solely responsible for how those funds are applied or any refunds. If You disagree with how Your payment was applied by the Agency please contact the Agency, not Lieberman Technologies LLC. If You believe a payment is an Unauthorized Transaction, You should contact Your Card Issuer first, not Lieberman Technologies LLC, through the contact method and information that appears on Your Card, such as a toll-free telephone number, web site or email address and discuss with the Issuer any possible Claim You may have. If You file a Claim with Your Card Issuer about a suspected Unauthorized Transaction, the Claim will then be referred to Lieberman Technologies LLC. This Tax Warrant Collection System reviews Claims during Our business hours, which are from 8:00 AM to 5:00 PM, Central Time Zone Monday through Friday, Holidays excluded. This Tax Warrant Collection System will not accept liability for Claims more than one year after the Transaction to which the Claim relates. Some Issuers may have specific rules or requirements about Your Transaction depending on the type of payment You make. Issuer and employer policies are out of this Tax Warrant Collection System's control. Please refer to documents made available to You with Your Card or the Issuer's web site for more information. This tax warrants collection system' statement of limited liability. Our sole obligation to you is to make payments to agency you have identified to us through your use of the service in the amounts that this tax warrant collection system has been informed by your card's issuer have been authorized. This tax warrant collection system, together with any incidental goods and related services are provided on an as-is, as-available basis. This tax warrant collection system makes no warranties that all or any part of the service will be error free or uninterrupted and disclaims all other representations or warranties, express or implied, including without limitation any warranties regarding quality, suitability, merchantability, or fitness for a particular purpose. This tax warrant collection system shall not be liable for any indirect, incidental, punitive, or consequential damages you believe you have suffered or incurred as a result of this tax warrant collection system providing the service under this agreement. You are responsible for giving this Tax Warrant Collection System accurate information so We can process Your payment. Our website provides various ways to help You confirm the information You need to provide to Us about Your payment and the Agency. Agency staff may also assist You. It is up to the Agency to specify in its contract with Us the manner in which funds are deposited through the Service. Typically, deposits take place in a two-business day electronic settlement cycle although the Agency may choose to receive funds by mailed check. Deposits we make or checks we send to the Agency are typically "in bulk" and cover all Transactions made during a daily payment processing cycle. Weekends and Holidays also affect the timing of this Tax Warrant Collection System's deposits to an Agency. This Tax Warrant Collection System is designed to help You to make payments to a sheriff's department for tax warrants. We presume Your use of Lieberman Technologies will be lawful. We have the right to bar You from using the Service if You: violate these Terms or any law, regulation or rule in making Your payment; provide false information in connection with Your payment; or refuse to cooperate in any investigation into any Claim. FRAUDULENT CARD USE IS A CRIMINAL OFFENSE PUNISHABLE BY LAW. Assignment. These Terms and any rights granted and obligations you accept as provided for under the terms of this document are personal to You and You may not transfer or assign them to anyone else. 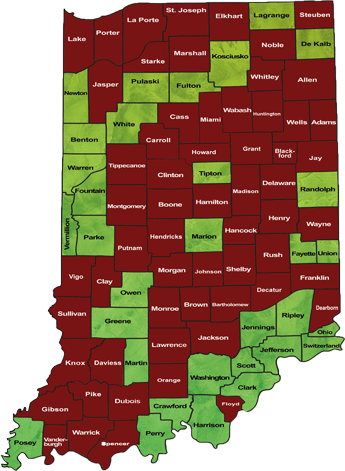 The Service this Tax Warrant Collection System provides is solely based in and reliant upon human and technical resources that are within the State of Indiana. This Tax Warrant Collection System website is a passive website requiring You to input accurate information and take other actions to complete a Transaction. Using this Tax Warrant Collection System does not result in personal jurisdiction for any purposes over this Tax Warrant Collection System outside of the State of Indiana. The laws of the State of Indiana, excluding the laws of conflict or choice of law, apply exclusively to the interpretation of these Terms. Any legal action You may take against this Tax Warrant Collection System may only be filed within a state or federal court of competent jurisdiction in the County of Vanderburgh, State of Indiana. Protecting your privacy is important to the Sheriff. This privacy statement discloses the practices used by this Tax Warrant Collection System to gather and disseminate information. This information is necessary to assist in the progress of your transaction. This information also helps in providing technical support if needed while you are using our site. Your IP address, a number that identifies your computer when connected to the Internet, is visible to us when you visit our website. We limit our use of your IP address to making sure our servers are working properly and helping us administer our website. The personal information you provide to this Tax Warrant Collection System will be kept confidential and used only to process your transaction. The office staff with access to this personal information are required to keep the information confidential and not use it for any other purpose other than to facilitate your transaction. The Administrator may be required by law to disclose personal information in cooperation with law enforcement, fraud prevention, regulation, and other legal action; the Sheriff may also disclose this information if it is reasonably believed it is necessary in order to protect the Sheriff, its customers, or the public. Your personal information is stored and processed on computers located in the United States, and is protected by our maintaining physical, electronic, and procedural safeguards that meet compliance standards set forth by applicable U.S. federal and state regulation. These safeguards include controlled physical access to our buildings and files, electronic defenses such as firewalls and data encryption, and authorized access to personal information only by those employees whose job responsibilities require such access in order to process your transaction. Your personal information will not be disclosed by the Administrator to any outside organization without your consent. Personal information such as name, address, and phone number will not be given or sold to any outside organization for marketing or solicitation purposes without your consent. Your information may be shared with agents or contractors of the Sheriff for purposes of performing services for this Tax Warrant Collection System. This Tax Warrant Collection System uses SSL encryption for data security with respect to information collected on our site. SSL encryption is the industry standard for security and operates by establishing an encrypted link between our web server and your browser. This encrypted link protects all data that passes between the web server and the browser, ensuring the information remains private. Any other websites that may be accessed through this Tax Warrant Collection System site may collect personally identifiable information about you. The information and privacy practices of those third-party websites linked to this Tax Warrant Collection System website are not covered by this privacy statement. It is your sole responsibility to maintain the secrecy of any password, transaction reference number, or account information associated with your use of this Tax Warrant Collection System website. Exercise caution whenever you are online. While we strive to protect your personal information, this Tax Warrant Collection System cannot ensure or warrant the security of any information you transmit to us, and you do so at your own risk. Counties that accept online credit card payments through this portal.